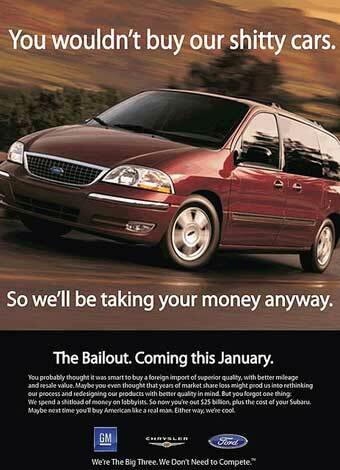 Auto Bailouts: A Success Story? What began as the ugliest of government bailouts—the rescue of General Motors, Chrysler, and the financing company GMAC/Ally—is now shaping up to be one of the success stories of financial crisis. In its latest report, released on Thursday, the bipartisan Congressional Oversight Panel (COP) revisits the $60-billion dollar bailout of two of the US’ “Big Three” auto companies, and its findings, in many ways, cast the GM and Chrysler rescues in a favorable light. For one, the ultimate cost to taxpayers, the panel notes, has been almost halved in the last 16 months. In September 2009, the non-partisan Congressional Budget Office projected taxpayers would lose $40 billion; that figure has since been revised down to $19 billion—still a massive loss, but not as bad as initially feared. Both GM and Chrysler are now on the road to recovery, the COP’s report found, thanks to a whopping $63.1 billion of taxpayer money injected into the two automakers to avert their collapse, giving taxpayers 61 percent ownership in GM and 10 percent in Chrysler. Since then, a restructured GM has conducted an initial public offering, raising $20.1 billion and signalling a rebirth of sorts for GM. Chrysler’s recovery has progressed at a slower pace, but it nonetheless looks set to regain its place in the US auto market. On one hand, the Treasury Department, which crafted and manages the auto bailouts, has just about met its goal of rescuing an ailing industry and the millions of jobs that come with it, the COP concludes. But when it comes to fully recouping taxpayers’ money, the COP’s findings are less rosy. While the CBO’s loss estimate has been significantly reduced, the COP found that when Treasury offloaded $13.5 billion of its stake in GM, it did so at $33 a share. The price needed to fully repay taxpayers, however, was $44.59 a share. “By selling stock for less than this break-even price, Treasury essentially ‘locked in’ a loss of billions of dollars and thus greatly reduced the likelihood that taxpayers will ever be repaid in full,” the panel wrote. Treasury is now on course to recover the majority of its automotive investments within the next few years, but the impact of its actions will reverberate for much longer. Treasury’s rescue suggested that any sufficiently large American corporation—even if it is not a bank—may be considered “too big to fail,” creating a risk that moral hazard will infect areas of the economy far beyond the financial system. Further, the fact that the government helped absorb the consequences of GM’s and Chrysler’s failures has put more competently managed automotive companies at a disadvantage. For these reasons, the effects of Treasury’s intervention will linger long after taxpayers have sold their last share of stock in the automotive industry.